Taxonomy is the branch of biology that classifies all living things. It was developed by the Swedish botanist Carolus Linnaeus, who lived during the 18th Century, and his system of classification is still used today. Linnaeus invented binomial nomenclature, the system of giving each type of organism a genus and species name. He also developed a classification system called the taxonomic hierarchy, which today has eight ranks from general to specific: domain, kingdom, phylum, class, order, family, genus, and species. A taxon (plural: taxa) is a group of organisms that are classified as a unit. This can be specific or general. For example, we could say that all humans are a taxon at the species level since they are all the same species, but we could also say that humans along with all other primates are a taxon at the order level, since they all belong to the order Primates. Species and orders are both examples of taxonomic ranks, which are relative levels of grouping organisms in a taxonomic hierarchy. The following is a brief description of the taxonomic ranks that make up the taxonomic hierarchy. A domain is the highest (most general) rank of organisms. Linnaeus did invent some of the taxonomic ranks, but he did not invent the domain rank, which is relatively new. The term domain wasn’t used until 1990, over 250 years after Linnaeus developed his classification system in 1735. The three domains of life are Bacteria, Archaea, and Eukaryota. Archaea are single-celled organisms similar to bacteria; some archaea live in extreme environments, but others live in mild ones. Eukaryota, or every living thing on earth that is not a bacterium or archaeon, is more closely related to the domain Archaea than to Bacteria. Taxonomic ranks are always capitalized, except for species. This allows people to differentiate between bacteria (the organisms; could refer to all bacteria or just two specific bacteria) and Bacteria (the domain, which includes all bacteria). Before domains were introduced, kingdom was the highest taxonomic rank. In the past, the different kingdoms were Animalia, Plantae, Fungi, Protista, Archaea, and Bacteria (Archaea and Bacteria were sometimes grouped into one kingdom, Monera). However, some of these groupings, such as Protista, are not very accurate. Protista includes all eukaryotic organisms that are not animals, plants, or fungi, but some of these organisms are not very closely related to one another. There is no set agreement on the kingdom classification, and some researchers have abandoned it altogether. Currently, it continues to be revised; in 2015 researchers suggested splitting Protista into two new kingdoms, Protozoa and Chromista. Phylum (plural: phyla) is the next rank after kingdom; it is more specific than kingdom, but less specific than class. There are 35 phyla in the kingdom Animalia, including Chordata (all organisms with a dorsal nerve cord), Porifera (sponges), and Arthropoda (arthropods). Class was the most general rank proposed by Linnaeus; phyla were not introduced until the 19th Century. There are 108 different classes in the kingdom Animalia, including Mammalia (mammals), Aves (birds), and Reptilia (reptiles), among many others. The classes of Animalia that Linnaeus proposed are similar to the ones used today, but Linnaeus’ classes of plants were based on attributes like the arrangement of flowers rather than relatedness. Today’s classes of plants are different than the ones Linnaeus used, and classes are not frequently used in botany. Order is more specific than class. Some of Linnaeus’ orders are still used today, such as Lepidoptera (the order of butterflies and moths). There are between 19-26 orders of Mammalia, depending on how organisms are classified—sources differ. Some orders of Mammalia are Primates, Cetaceans (whales, dolphins, and porpoises), Carnivora (large carnivores/omnivores), and Chiroptera (bats). Family is, in turn, more specific. Some families in the order Carnivora, for example, are Canidae (dogs, wolves, foxes), Felidae (cats), Mephitidae (skunks), and Ursidae (bears). There are 12 total families in the order Carnivora. Genus (plural: genera) is even more specific than family. It is the first part of an organism’s scientific name using binomial nomenclature; the second part is the species name. An organism’s scientific name is always italicized, and the genus name is capitalized while the species name is not. Genus and species are the only taxonomic ranks that are italicized. The scientific name for humans is Homo sapiens. Homo is the genus name, while sapiens is the species name. All other species in the genus Homo are extinct. Some were ancestral to humans, such as Homo erectus. Others lived at the same time, were closely related, and interbred with Homo sapiens, such as Homo neanderthalensis, the Neanderthals. Species is the most specific major taxonomic rank; species are sometimes divided into subspecies, but not all species have multiple forms that are different enough to be called subspecies. There are an estimated 8.7 million different species of organisms on Earth, but the vast majority have yet to be discovered and categorized. While each genus name is unique, the same species names can be used for different organisms. For example, Ursus americanus is the American black bear, while Bufo americanus is the American toad. The species name is always italicized, but never capitalized. It is the only taxonomic rank that is not capitalized. In scientific articles where the species name is used many times, it is abbreviated after the first full use by using just the first letter of the genus name along with the full species name. Homo sapiens is abbreviated to H. sapiens. 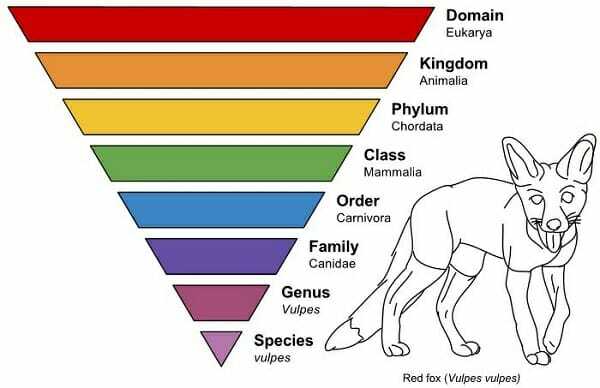 Another example of taxonomy is the diagram below, which shows the classification of the red fox, Vulpes vulpes (sometimes the genus and species names are the same, even though these are two different ranks). Many mnemonic devices can be used to remember the order of the taxonomic hierarchy, such as “Dear King Philip Came Over For Good Spaghetti”. Taxon – A population of organisms that has been grouped together by taxonomists. Binomial nomenclature – A two-part system of naming species; species are referred to by their genus name followed by their species name. Taxonomic hierarchy – An ordered group of taxonomic ranks used to classify organisms from general to specific. Taxonomic rank – A level of a group of organisms in a taxonomic hierarchy. 1. Which taxonomic rank is more specific than order but less specific than genus? B is correct. Family is the rank in between order and genus; it is more specific than an order, but less specific than a genus. Animal families end with the suffix “-idae”. Humans are in the family Hominidae. 2. What is the scientific name for humans? D is correct. The scientific name for humans is Homo sapiens. Scientific names are always italicized, so choice C is incorrect. 3. Why is taxonomic classification used? A. It allows each species to be uniquely identified. B. It gives us an idea of how closely two organisms are related. C. It has been unnecessary to change taxonomy since Linnaeus invented it in the 18th Century. D is correct. Taxonomic classification gives a unique name to each species, and it makes it easier to tell how closely they related; for example, if two different species have the same genus name, then they are more closely related than those that have different genus names. Choice C is incorrect because although taxonomists still use Linnaeus’ system, some organisms have been reclassified over time, and newer taxonomic rankings like domain, kingdom, and phylum have been introduced.